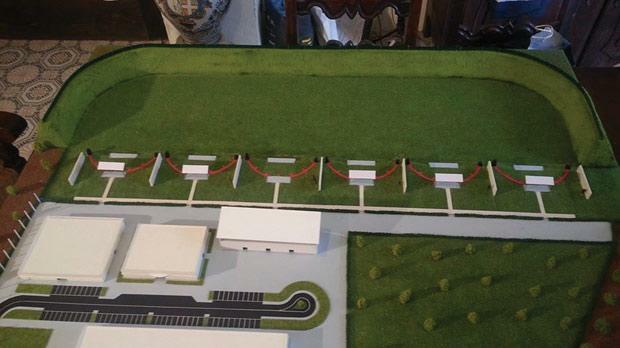 A model of the new MSSF shooting range. Construction is expected to start next year. The international shooting body has promised the Malta Shooting Sport Federation (MSSF) that it will host a World Cup shoot in 2017, president Saviour Portelli told a news conference yesterday. Portelli said that the MSSF had initially lodged a bid to host the 2017 World Championships during the General Assembly of the International Shooting Sport Federation (ISSF), held in Munich earlier this month. However, the Maltese delegation was approached by the ISSF top brass who asked them to withdraw their bid and give their backing to Moscow. In return, the ISSF pledged to award the Maltese federation hosting rights for a World Cup shoot in 2017. “Earlier this month the MSSF attended the ISSF General Assembly where we submitted our bid to host the 2017 World Championships,” Portelli told the media at the MSSF headquarters in Bidnija. “Malta was one of eight bidding countries along with Moscow (Russia), Granada (Spain), Nicosia (Cyprus), Acapulco (Mexico), New Delhi (India), Texas (United States) and Maribor (Slovenia). “With the assistance of the Parliamentary Secretary for Sport, the Maltese Olympic Committee and the Malta Tourism Authority we put together a strong bid to attract the backing of the delegates. “However, before we began our presentation, the president and secretary of the ISSF called me for a meeting. “They asked me to pull out of the race and pledge our backing to Russia. The ISSF president told us that, in exchange, we will get a World Cup shoot in 2017. Portelli said that confirmation of the MSSF as one of the five hosts of a World Cup shoot will be given early next year but expressed his confidence that the world governing body will keep its promise. “I personally have no reason to doubt whether the ISSF will keep their word as the federation is led by people of great integrity who have supported us for many years,” Portelli said. “We were one of five countries that received such a proposal from the ISSF. I’m sure that the world body will stand by what they said and early next year we will be confirmed as one of the five World Cup hosts for 2017. “This will be a huge challenge for the MSSF as we have never organised an event of this magnitude. “The competition attracts up to 25 shooters from each of the 136 countries affiliated with the ISSF, so the number of participants will be huge. Malta’s hopes of hosting a World Cup shoot in 2017 largely rest on the building of a new shooting range. The MSSF was meant to organise the 2008 and 2010 World Championships but, on both occasions, they lost hosting rights after the government’s plans to build a new shooting range came to nothing. Chris Agius, the Parliamentary Secretary for Sport, said the current government will deliver on its promise. He revealed that the project was underway with construction work due to start next year. “The building of a new shooting range was one of the electoral promises of this government and we are committed to completing this project in the next couple of years,” Agius said. “We have already identified two potential sites but a final decision has not been made.